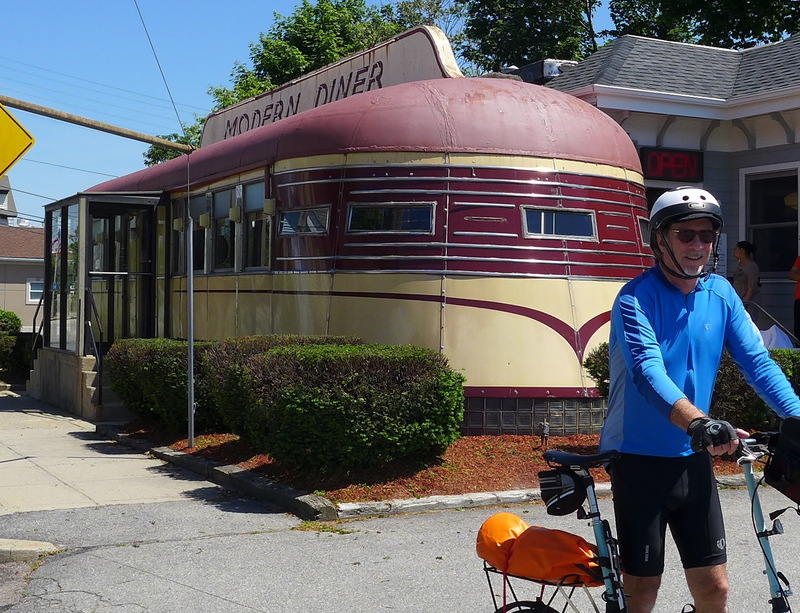 Lyman and I bicycled for five days across a broad arc west of the Boston area, following the fall line; the waterfalls that powered the first American industry. We slept in the downtowns of each of these cities: Providence RI, Worcester MA, Lowell MA, Gloucester MA, and Boston. I now realize this industry started very early, as early as the late 1700’s. Some of this was based on textile technology we had stolen from the British. Many of these factories had closed by the 1920’s, or earlier. In some places they now are vibrant rehabbed loft spaces, in other places they are empty abandoned buildings. This empty mill in a small Massachusetts town looks a lot like Bynum or Saxapahaw, North Carolina. According to Wikipedia, Lawrence, Massachusetts has torn down many of their old factories. To a first time visitor, you would not have guessed that. There are many, many huge brick mill buildings. 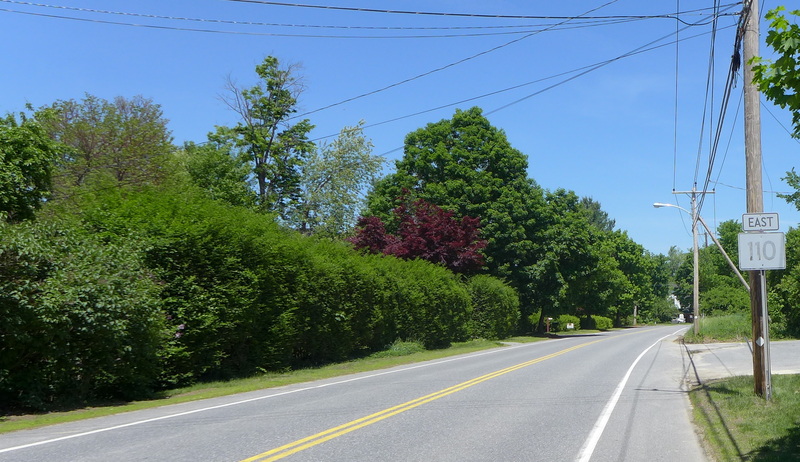 Most of the bike riding between these towns was delightful. “Highways” that had a speed limit of forty miles per hour, with wide shoulders, meandered through the woods and towns. I now theorize that Northeastern roads have wide shoulders, not out of concern for bicyclists, but because they need somewhere to put the plowed snow. We stopped for ice cream in a small town in Massachusetts. What could be more all-American than this? In a few places there were greenways. 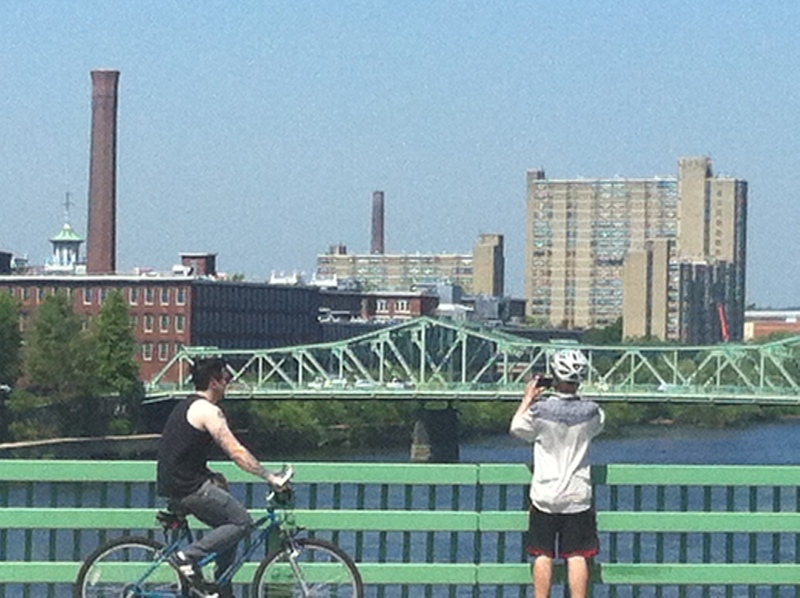 We parked our bikes to have a beer in Lowell MA. This town looks grungier than the photo indicates. In Gloucester, the fishing town vibe permeated everything. The first impression is that Gloucester is a working class coastal town that looks neither gentrified nor abandoned and depressed; an intact town of eighteenth and nineteenth century buildings. I do not see many places in America like that these days. Someone said Rhode Island has the highest concentration of diners in America. This is in Pawtucket, just north of Providence. Modernism plopped amidst the brick industrial mill buildings of Lowell, MA. We spent the final night in an AirBnb in Roxbury, Boston. Cycling through downtown Boston at 5:30 AM to Amtrak at South Station was exhilarating. Once again Paco, you have documented a slice of America some of us will never see. I’m glad you made it through Boston traffic at 5am.